The first pizza pair off occurred this past Nerd Night Monday at an undisclosed location in Clintonville. 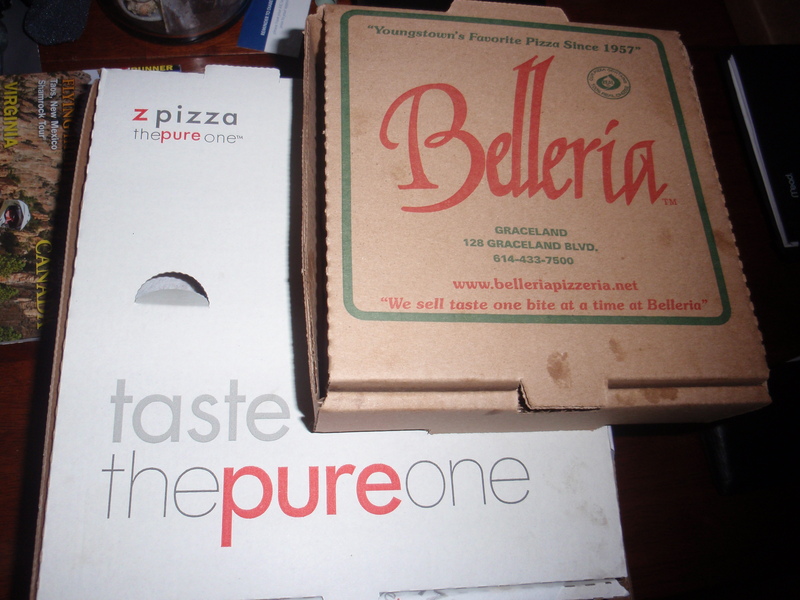 The Battle of Graceland pitted Z Pizza vs. Belleria Pizza. An additional disclaimer for this series. There was a brief attempt at rational and objective judging criteria using the Kansas City BBQ Society judging guidelines as a basis for the taste off. This was a clear failure within ten seconds of suggesting this sane method of evaluation. As my gal pal Andrea would say “what evs”. More back story. Belleria has sixteen locations in Northeast Ohio and two franchises in Columbus – thus the prime directive of no chains is compromised. Belleria started in Youngstown in the 1950’s. Why did this place make the cut? They are still unique to Columbus and Clintonville. They deliver to the undisclosed location. 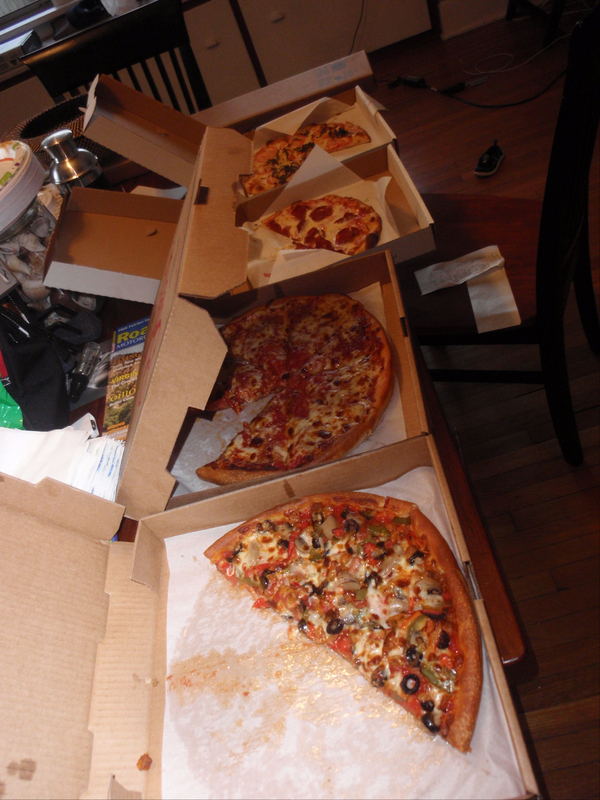 Z Pizza has locations in sixteen states, Washington DC, the Middle East, Mexico and Vietnam. Really. Z pizza is unique in central Ohio with one Clintonville location and one in the Short North. They deliver to the undisclosed location. I can’t say the battle was hard-fought. We are so used to the value and massive bulk of Adriaticos that getting less pizza for more money was a moral and morale shock. One individual led the discussion with “I hate Z Pizza, it made me sick years ago, so it already lost.” This is the type of thing a food sociologist and enthusiast such as I must deal with. Grrrrrr. What happened. After some trial and error and a lot of whining about having to wait to watch TV because I was still collecting data, I decided to settle the matter using a McLaughlin Report style aggressive questioning technique of the pros and cons of each pizza with each nerd. After everyone said their peace about the pieces, each person was allowed an opportunity to vote. “more fart inducing” (really….this is the caliber of test subjects I am working with here). Having gathered the feedback above with tooth pulling precision I opted to do a vote. The champion was Belleria with seven votes. Z Pizza received one. Much like the Henry Fonda character in Twelve Angry Men, I had to respect the observations of the lone dissenter. It is difficult to compare the two pizzas because their styles are very different. Each had strong points and weak points. We thought both were over priced. Other than our resident contrarian who voted against Z Pizza years before, we all found merit in the Z Pizza crust. The French Fry pizza from Belleria is quite superior and deserves a special nod. Hoping for a bracket by next week (Hint: Roland). This entry was posted on March 20, 2012 at 8:25 PM	and is filed under Clintonville, culinary knowledge, pizza. Tagged: Nerd Night Clintonville Pizza Challenge. You can follow any responses to this entry through the RSS 2.0 feed. You can leave a response, or trackback from your own site. You have an extremely broad definition of Clintonville. Dear Elvis, you are dead. For the purposes of this challenge, the definition is not that much of a stretch. As a person that grew up on Bleneheim, lived on Northridge after college and has lived in Beechwold for a decade – I think I have a pretty clear idea of the defined and undefined boundries of Clintonville. All of the places listed reside in Clintonville (as I grew up in), are within boundries listed by the Clintonville Area Commission or are places that deliver to Clintonville and or have been patroned by people in Clintonville for decades. Pizza House has been a go to for people living north of Cooke Road since the 1950’s. I love this pizza challenge and can’t wait to read more! Also note that everytime I read “Nerd Night” I heard it in my head with a British accent and it makes me smile. Clarification: There is rarely a Brit in the House for Nerd Night due to a conflicting of tastes. The thing that makes me a zpizza convert is the fact that they have gluten free pizza crust that is amazing. So many places try for gluten free crust and fail… zpizza does a great job. Yes, it’s a little pricey, but this fact alone makes it worth it to me. The thing I really did not like about Belleria was the sauce. It is very chunky with peppers and onions. I have heard that they make some of the pizzas with their smooth spaghetti sauce so I might try it again. zPizza is a nice change from standard Columbus square cut pizza. I’m really looking forward to the next battle as we have recently completely abandoned Pizza House in favor of Pizza Mart over the last year. For one thing, we like the pizza better. For another, the owner of Pizza Mart is a really neat old guy who I love going in to talk to. He also takes care of several homeless cats. He won’t ever take a tip from me but he will let me put money in the cat food jar. Sometimes I just bring in bags of food for him if I find a good sale.